Simple or not? Well, hopefully after reading this you can say that’s simple. Simple syrup is basically just two ingredients, sugar and water. Start with a basic 1:1 ratio. That’s 1 cup of water to every cup of sugar. If you’re making a traditional simple syrup all you’ll need is water hot enough to dissolve your sugar. That’s it. You don’t have to cook it. It’s just a basic sugar water. Let’s talk about the sugar. There’s a bunch of sugars you could use. Sugar substitutes like: stevia, splenda. Ok granted I just complicated things a bit, but bare with me here. Really, you can make this as simple or complicated as you want. With that said, demerara is your premium and most expensive sugar. Check. Lately, I’ve been using Sugar in the Raw which is a turbinado sugar and is similar to demerara. You’ve probably seen them at your local coffee shop. It’s that brown sugar packet. If you are looking for a richer syrup this is the way to go. This sugar is made from real sugar cane, not sucrose like white sugar. White sugar can be important if you’re looking for a clear syrup to add to your cocktail. Demerara and turbinado are going to give a brown hue to your simple syrup and ultimately to your cocktail’s color profile. Brown sugar, maple syrup and molasses are the heaviest and most prominent. This is going to give you a thick, dense simple syrup that will stand out in your cocktail. So back to making your simple syrup. The ratio of water to sugar is really up to you and how sweet you like your drinks or how thick you want your syrup. 1:1 ratio is safe, but taste it and experiment to your liking. I like to adjust my simple syrups to what kind of cocktail I’m making. With basic simple syrups, I usually go with a 2:1 water to sugar ratio. This is on the weaker side. However, I don’t like my drinks too sweet. But if you are going for a richer syrup and cooking other ingredients in the syrup, I go with a 1:1. If you’re making simple syrup for a grenadine you might want to go with a 1:2 water to sugar ratio. But remember the longer you cook your simple syrup the thicker and sweeter it gets. The ratio you decide on also effects your volume and density of your cocktail recipe. So keep this in mind as well. You can also add herbs and spices to your simple syrups, the combinations are endless. Here are some. You can order nice organic herbs and spices here on the web at Mountain Rose Herbs. When cooking I usually simmer my syrups for 30–45 minutes to extract the flavors. When using fresh herbs like basil or rosemary, cook until the herbs start to turn brown and remove the herbs right away. Then taste your syrup after that point and adjust to see if you need to cook more herbs to intensify your flavor. Don’t be afraid to experiment and make to your taste. If you are using the syrups for cocktails I would recommend putting a shot of vodka in the final product to extend the shelf life. Simple syrups should keep for about three weeks. Always make sure the glass bottles you are using are sterilized. To do this boil water and fill the bottles up with the boiling water and allow to sit for about 20 minutes. Here are some of the syrups I’ve been using for fall. Combine all ingredients except vanilla extract in a saucepan. Simmer for approximately 30 min­utes. Strain threw a sieve and cheesecloth and funnel into a glass bottle. Allow to cool and add vanilla extract and a shot of vodka. Keep in the refrigerator for approximately 3 weeks. Simmer for approximately 30–45 minutes. Strain through a sieve and cheesecloth and funnel into a glass bottle. Add a shot of vodka and refrigerate for approximately 3 weeks. Simmer for approximately 30–45 minutes. Strain threw a sieve and cheesecloth and funnel into a glass bottle. Add a shot of vodka and refrigerate for approximately 3 weeks. You can also make a thin caramel, and then add the rest of the water to it to make a caramel simple syrup. I made caramel apple mimosas that way (using single source apple juice and caramel simple syrup with a mineral-heavy champagne.) I like to almost burn the caramel, so that the flavor holds up to when the extra water is added. For five, very sweet, drinks, I used half of a cup of sugar and a tablespoon of water (just enough to get it all wet) and then heated it. The trick is to not stir it, just let it bubble away and get good and dark — a rich amber is your best bet. Then turn down the heat and add half a cup of hot water. Stir like mad, turn up the heat a bit, and make sure it all mixes evenly. The trick here is to use hot water so that the caramel doesn’t cool and become semi-solid. The other drink I use this for is an applejack/bourbon/caramel contraption. I like this culinary approach! I’ve made burnt sugar for my bitters and it definitely made a mess of my cookware. I’ve got to try one of your cocktails including this technique. This is a great idea for fall and something I should venture into with my cocktail creations. Thanks Andrew! why the shot of vodka to finish the simple syrups? does it help make them last three weeks? is it a flavor element? wassup? This helps to preserve the syrup. Keep in mind most vodkas are made to taste like nothing, woo. So, adding 1, 2, or 3 shots of vodka how much can the syrup last? How do I make syrup last years? Try canning. I make up a batch and can in smaller “single use” jars. I see that you have this down to a science. The syrup infused with the herbs sound very creative but what do you use it with? Please share this is now to me and I am very interested. If you go to my recipe page and click the “more options” button you can sort all my recipes by all kinds of ingredients. Shake in a cocktail shaker until your hand can’t take it anymore. Have aspirins ready for the next day because these go down smooth! Love the creativity. Never settle for the status quo. “You’ll need [is] water hot enough to melt your sugar.” There is no sugar melting, it’s increasing the ability of the water to dissolve the sugar — to create super saturated sugar-water. You’re right. Noted & corrected. “A shot of vodka to help preserve the syrup”…and does it also need to be refrigerated? I would love to keep my lavender simple syrup in a beautiful bottle on display on my counter top. I guess it matters how fast you’ll use it. I always refrigerate mine to make it last longer. If you’re going to use it in a couple of days it should be fine. try to use tartaric acid.will last waaayyy longer​.no need for vodka then. Has been finding a preservative. Will these keep in the freezer? I’d like to give them as Christmas presents, but I’d rather not spend every waking moment of the week before Christmas making them. Sarah-I’ve never tried to freeze my syrups. I’m sure it would work. Give it a try and let me know how it works. Help! I made a simple syrup with two parts sugar and one part coffee. It taste great. But, after a night in the fridge, it “went back to sugar”. Some of the sugar re-crystalized. Any advice on how to prevent this? Should I reduce the sugar and perhaps add a little corn starch to thicken it? I’m not sure how the sugar undissolved? If you wanna bind the two maybe try adding a dusting (1/16th teaspoon) of xanthan gum. There are a couple of ways to prevent crystallization. If the water has boiled with the sugar when preparing the syrup the chances are higher that the syrup will crystallise. So try to stay below boiling point. When making a flavoured syrup (like with herbs) you can boil the water to have a better extraction of the herbs (or other) and add sugar at a later time. Another thing you can do is to use a fine mesh strainer to make sure there are no sugar crystals in your syrup. When there is one crystal, other crystals grow around it. When you do have a syrup with sugar crystals in it, you can leave the bottle in hot water and the syrup will become liquid again. Nice. Thank you for sharing your knowledge. That is odd…I have never seen sugar do that in water without some form of solid base to attach to (thing science project of making rock candy)… you may not have dissolved the sugar fully. I love making symple syrups and as a chef have been making them for my bartenders for years. As for the sugar recrystalizing, sugar has two natural states it is either a crystaline solid or liquid anyone who has ever messed up a batch of candy knows that when it starts to crystalize your pretty much S.O.L. The crystalization of sugar is a chain recation caused by having sugar in the crystal form interact with sugar in the liquid form and then heat being introduced. The easiest way to prevent this is to make sure that when your melting your sugar that you constantly wipe off the rim of your pot at the water line and incorporate all the sugar so it all melts. As for the short shelf life of syrups, I have been adding a bit of citric acid to mine for years (vitamin c tablet) about 1 tablet per 750ml and this will double the shelf life and help stabalize the color so it doesn’t start to brown. Thanks Charlie for the informative comment! Vitamin c tablets are also great for preserving color in certain juices like cantaloupe, peach, etc. I also like to vacuum pump my syrups, juices, vermouths, if possible. Do you know if the citric acid would work in a simple syrup made with stevia?? Just made my first batch of lemongrass simple syrup. How long will it last if refrigerated? Cheers. What does the 3 weeks in the fridge do for the simple syrups? Oh good Lord putting the fall simple syrup in a Sazerac is out of control. Thanks for these. 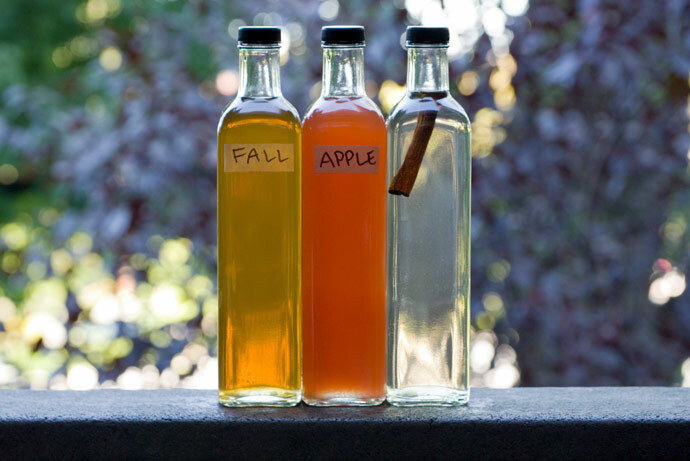 For the Fall Simple Syrup, do you leave the nutmeg whole or chopped? That sounds fantastic by the way! I usually crack the nutmeg open. So glad to see people interested in sharing knowledge its really refreshing. I was wondering if there is a secret to using herbs and potentially fruit. Like say if you wanted to do a combo of strawberry basil or raspberries and mint or bing cherry and rose hip etc. I was just wondering if there is a different cook time for these items because of the way they break down. Watermelon is another that seems like it would require different instruction. Thanks in advance! Ok– So the basics are a little trial and error and watch your cook times. I am going to start doing batches tomorrow and will update you. I am just trying different combos for house made sodas and cocktail syrups so I am trying to use The Flavor Bible to accomplish this. Talk soon. Is the vodka necessary in your simple syrups? I’d rather not use it. Will it change the “life” of my syrup if I don’t use it? I use my syrups for cooking, coffee and tea. It is not necessary to use vodka in the simple syrups. People always ask me how they can prolong the shelf life and that is just one way. I like to vacuum pump my syrups, that should help. Also, make sure your bottles are clean and sterile. Hello everyone. I am an old bar tender turned mixologist. I specialize in Tiki/Tropical cocktails, so I make a lot of orgeat, falernum and other complex syrups for my cocktails. Demerara and Turbinado are both spun dry in a centrifuge to remove excess plant material and to crystallize into their honey toned color. Demerara has a nice mild molasses flavor. Turbinado, has pronounced hints of honey. Beyond this difference in flavor, this sugar is processed the same way Demerara sugar is processed. FYI — Tubinado sugar makes an excellent BBQ rub for Ribs. It doesn’t create a carmelized black ‘casing’ over the meat like Muscovado or brown sugar does. Muscovado sugar (a.k.a. Barbados sugar), is not dried in a centrifuge but rather dried under low heat, sometimes in the sun. Since the plant material isn’t separated through a centrifuge process, this leaves more plant material in the sugar, resulting in a very strong molasses taste and a sticky and wet consistency. So, when I am crafting a Jet Pilot, I use Demerara sugar as the base for my cinnamon syrup…to compliment the use of Demerara rums in the cocktail. But, when I am concocting a Navy Grog, I employ a little Turbinado sugar in my honey mix to help promote the honey flavor in the cocktail. Josh, I love your page and the converstion that it stimulates! Cheers & Aloha to all! Thank you for this article Josh! How would you go about this thickening a syrup after it is cooled and too thin? I have liquid sugar in the raw. To make a sour mix, would I need to dilute the liquid sugar with more water, or just use as is? I’m not sure of dilution rates on store bought simple syrup. If it’s really thick, I would assume it would be 2:1 sugar to water. I’m guessing it’s 1:1 though and then you should do equal parts with you sour mix. Great question. Stevia has about 30–45 times the sweetness of sugar, so it requires a much different ratio — I’d recommend starting off at 3 parts water to 1 part Stevia, and adjust to your taste as necessary. Good luck, Mary! I use up my simple syrups pretty quickly, so I usually don’t add anything to preserve it. My advice would be to use a 2:1 ratio (higher sugar concentration makes the syrup more stable) and distilled water. Other than that, citric acid can work well as a natural preservative. Some folks add a tablespoon or so of high-proof vodka to extend the shelf life of their simple syrups, but that obviously might not be the best solution if you’re using it for shaved ice, rather than cocktails. Good luck! Amy: if your syrup is too thin, maybe reheat it and cook it over low heat until it’s reduced and thicker, or reheat and add more sugar. I have tried making a ginger simple syrup and black peppercorn syrup for the fall but the end product does not have the spiciness of ginger or pepper I am after. I assume I am cooking it out. I have even tried combining the two into one syrup for the extra hit of heat; no dice, either. Any advice on how to keep these syrups spicy? Maybe an oleo saccharum? Is an oleo saccharum possible with peppercorns? Melissa, I make a ginger syrup by boiling my leftover ginger pulp (After juicing the ginger for ginger beer) then straining it. In order to make it very strong, I use only a litre of water to probably 5-8kgs of ginger. Of course you can’t fit that much pulp in a litre, so I put in about a kg at a time, boil it, then run it through a macerating juicer twice. Then put the extracted ginger water in the pot and boil more pulp. Once I’ve juiced it all, it looks like a muddy, brown puddle. Then I add in regular white sugar at a 4:1 ratio (very thick texture! ), at the end, it’s still quite spicy, but it goes clear amber colour, rather than cloudy. So I suggest you try using way more ginger than can fit in your water, just boil it in batches with the same water. Also, it’s super hard to keep 400% sugar in solution, especially one that already has some ginger particles in suspension too. I use a bit of citric acid, which helps, but I used too much tonight and strangely it turned to a thick foam when it was hot, before precipitating. Oh, and you could try mashing a chilli pepper into the water when it’s boiling. I dropped a Chinese red chilli into my ginger beer, mashed it up and left it for a week and it was very spicy. It eventually gave me a stomach ache. I have just opened a snow cone stand and have been buying concentrated snow cone syrup and mixing it myself to make a gallon. My question is if anybody knows why my syrup isn’t very dark in color. A lot of the flavors are light colored and barely even shows up once it poured on the ice. Any information would be appreciated.